Sri Lankan troops went all out against the LTTE and captured two camps used by its suicide wing in the north of the island killing 12 Tamil Tigers, as they failed to honour a 48-hour deadline set by the government to release civilians caught in the war. US Secretary of State Hillary Clinton is still saddled with $5.9 million in debts left over from her unsuccessful 2008 presidential bid, records filed with the Federal Election Commission show. The Obama administration, which has signalled its intention to close the Guantanamo Bay detention facility for terror suspects within a year, is experiencing difficulties in finding a place to imprison detainees who may not be accepted by any country. Pakistan Foreign Minister Makhdoom Shah Mahmood Qureshi has said the initial findings of the (Pakistani) probe into the 26/11 Mumbai attack on the basis of the Indian dossier would soon be conveyed to New Delhi through diplomatic channels. The probe report, he claimed, would prove Pakistan's sincerity in its efforts to defeat the common enemy - terrorism. A suicide car bomber attacked a convoy of French troops in the Afghan capital of Kabul today, wounding three people, including one of the soldiers, the French military and the Afghan government said. As the 48-hour ultimatum given by the Sri Lankan government for the LTTE to allow safe passage for people trapped in the areas controlled by them in Mullaitivu district in north Sri Lanka ended on Sunday, there were no signs that the LTTE was willing to allow a free movement of civilians. At least 22 persons died when fire gutted a remote and wooden care home in the northwestern Russian republic of Komi, a spokeswoman for the local branch of the emergencies ministry said today. A Pakistani schoolgirl, who was a victim of the Taliban’s ban on girls’ education in the troubled Swat valley, is writing a diary documenting her pain and anguish at the destruction of schools in the region. “I was afraid going to school because the Taliban had issued an edict banning all girls from attending schools,” writes the seventh grade schoolgirl from Swat. “The night was filled with the noise of artillery fire and I woke up three times. More than 45 people, including 16 militants, have died in violence and security operations in the Swat valley in northwestern Pakistan even as a federal minister from the region resigned today to protest the government’s failure to control militancy. China's degrading environment is responsible for the birth of a new born with physical defects every 30 seconds in the country, a senior planning official has said. "The number of newborns with birth defects is constantly increasing in both urban and rural areas," Jiang Fan, vice-minister of the National Population and Family Planning Commission , was quoted as saying by the China Daily today. The troops of the 58th division captured two “Black Tiger” camps in the Visuamadu area last night with inflicting heavy damages to the terrorists, the Media Centre for National Security (MCNS) said. “LTTE terrorists continued worsening suffering of the thousands of civilians entrapped in the outskirts of Mullaittivu, ignoring the 48-hour ultimatum served for the safe passage of civilians,” the defence ministry said today. The troops also recovered a large cache of weapons, including mortar launchers, rifles, rocket propelled grenades, light machine guns, grenades, mines, bombs and detonators, from the camps. In one camp, troops found a bungalow complete with roads and nine A5 weapons to fire “gas” were also recovered. “Two storeys built underground consisting of three rooms were found equipped with beds, refrigerators, modern bathrooms, toilets, noiseless electric generator, accessories and cupboard,” the MCNS said. But, it was not clear whether Tiger supremo Velupillai Prabhakaran used the camp. An overturned petrol tanker exploded as hundreds of people were trying to scoop up free fuel, killing at least 111 persons and wounding 200, officials said today. Nearby hospitals were packed with victims, including small children, suffering from horrific burns. “Everybody was screaming and most of them were running with fire on their bodies, they were just running into the bush,” said Charles Kamau, 22, who was driving through the town of Molo last night when he saw the road blocked by hundreds of people surrounding the overturned truck. As he waited to get through, the petrol ignited. “I just ran to where there was no fire,” he said at a Red Cross tent where he was reporting a missing friend today. Burnt-out cars and charred clothing littered the road where the shell of the tanker stood in Molo, about 170 km outside the capital, Nairobi. Kenyan Prime Minister Raila Odinga said it appeared that someone’s cigarette caused the explosion. 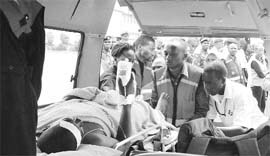 The Kenya Red Cross said the death toll was 111 but was expected to rise. America’s top diplomat has been steadily chipping away at unpaid campaign bills since suspending her White House bid in favour of her rival Barack Obama in June, when her debt peaked at $25.2 million. That amount included both $12 million owed to vendors and the $13.2 million she loaned her campaign from personal funds. Clinton’s campaign was unable to repay that personal loan by the time the Democratic National Convention convened in Denver, Colorado, in August, the deadline mandated by the 2002 McCain-Feingold campaign finance law. Clinton and her supporters had been in a race against time to pay off as much of the debt as possible by the time of her swearing-in as the secretary of state on January 21. Topping the list for new home for the detainees, says Newsweek, is Fort Leavenworth, situated in Kansas, but Governor Kathleen Sebelius, an Obama pal, is making sure that the new detention centre is not located in her state. "I'm happy to find a solution but would make strong argument that ‘this isn't’," she was quoted as saying by the magazine. In a letter to Defence Secretary Robert Gates, she said putting terrorist suspects there would undermine the base and pose a danger to the community. Leavenworth is one of at least three sites under examination by the Department of Defence as alternatives to Gitmo. Newsweek says Pentagon survey teams have visited Leavenworth and Camp Pendleton in San Diego since Obama was elected President on November 4 last year. The US Naval Brig in Charleston, South Carolina, is also on the list. In response, members of Congress representing the districts where the three facilities are located have each proposed NIMBY ("not in my backyard") bills that would prevent the government from dumping Gitmo suspects on them, the report says. "Not only is the brig within walking distance of sensitive military facilities ... but it is less than two miles away from surrounding civilian suburban neighbourhoods," Republican Henry Brown of South Carolina said in a statement. Taking a stand, says the news magazine, was surely a tougher call for Sebelius, who was briefly touted as a possible Obama running mate during the campaign. Also, Qureshi dismissed "as premature and given in haste" the statement by Wajid Shamsul Hasan, Pakistan's high commissioner in London. Hasan had, in an interview with NDTV, claimed that the Mumbai attacks did not originate in Pakistan. Wajid, said he, was not authorised to make such comment unless the Pakistani version was finalised. Speaking to mediapersons in Multan, Qureshi said Pakistan wanted resumption of composite dialogue with India as early as possible. He, however, acknowledged that "realistically speaking" India and the rest of the countries were looking at Pakistan to see what action it took. "We are moving forward in the right direction and will take India and the other countries into confidence by sharing the findings of the initial probe," Qureshi said. He said bilateral cooperation on the issue was the key to ensure successful prosecution of the culprits in Mumbai attack. The findings of Pakistani probe would be vetted by the law ministry before the foreign ministry received them and passed on to India and other countries via diplomatic channels. Answering a question, Qureshi said Pakistan had received some positive initial vibes from the Obama administration and hoped both the sides would build on that. The blast took place on a road leading into the adjoining province of Wardak where Taliban insurgents are known to operate. The bomb exploded near a convoy of French soldiers, who are helping to train the fledgling Afghan National Army, French military spokesman Lieutenant Colonel Jerome Salle said. The military said around 100 civilians had crossed over in the past two days having escaped from the clutches of the Tigers, but more than 1,20,000 were believed to be trapped in the areas where much of the fighting between the government troops and the Tigers was in progress. President Mahinda Rajapaksa on Sunday once again asked the LTTE to give up their armed struggle in the face of inevitable defeat and the suffering of the Tamil people. The military said according to available information, the Tamil Tigers were manning a forward defense line in the outer perimeters of the so-called safe zone declared by the government for civilians to make a safe passage into the government-controlled areas. Although the military said there would be no let up in the fighting, the government says it will continue to adhere to the zero-civilian casualty policy. President Dmitry Medvedev dispatched the Kremlin’s envoy in northwest Russia to investigate the blaze in the Podyelsk village, 120 km from the regional capital, Syktyvkar, which was brought under control by firefighters early today. Fire broke out at the care home, which houses 26 residents, mostly elderly, early last evening, Terenteva said by telephone from Syktyvkar. Three women were rescued before firefighters arrived at the single-storeyed building. Prosecutors are questioning three staff members who survived the fire, Terenteva said. A Pakistani schoolgirl, who was a victim of the Taliban’s ban on girls’ education in the troubled Swat valley, is writing a diary documenting her pain and anguish at the destruction of schools in the region. “I was afraid going to school because the Taliban had issued an edict banning all girls from attending schools,” writes the seventh grade schoolgirl from Swat. “The night was filled with the noise of artillery fire and I woke up three times. But since there was no school, I got up later at 10 am. Afterwards, my friend came over and we discussed our homework,” the girl wrote under pseudonym ‘Gul Makai’. 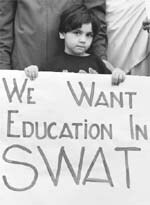 The Taliban has banned the education of girls in Swat from January 15 and destroyed nearly 200 schools. “Today is January 15, the last day before the Taliban's edict comes into effect, and my friend was discussing homework as if nothing out of the ordinary had happened,” Gul wrote. “Only 11 students out of 27 attended the class. The number decreased because of Taliban's edict. My three friends have shifted to Peshawar, Lahore and Rawalpindi with their families after this edict,” she wrote. On January 14, Gul Makai’s entry was titled: “I may not go to school again”. She wrote: “I was in a bad mood while going to school because winter vacations are starting from tomorrow. The principal announced the vacations but did not mention the date the school was to reopen. This was the first time this has happened. In the past the reopening date was always announced clearly,” Gul said. She wrote that the girls were not too excited about vacations because they knew if the Taliban implemented their edict, they would not be able to come to school again. “Some girls were optimistic that the schools would reopen in February but others said their parents had decided to shift from Swat and go to other cities for the sake of their education,” she wrote. “No one has gone to school following the deadline given by the Taliban...(my friend) said no one has made the Taliban suffer but when they are hurt they take it out on our schools. The army is not doing anything about it. They are sitting in their bunkers on top of the hills. They slaughter goats and eat with pleasure,” Gul said. In another piece titled “Today at school”, she writes about Maulana Shah Dauran, the Taliban leader behind the ban. “We discussed the rumours about the death of Maulana Shah Dauran, who used to give speeches on FM radio. Some girls said he was dead but others disagreed. The rumours of his death are circulating because he did not deliver a speech the night before on radio. One girl said he had gone on leave,” Gul said. Her diary entries also include discussions with classmates about the Taliban, who now control large parts of the Swat valley and have gunned down dozens of people who opposed them. At least 16 militants were killed and many others injured in gun battles with security forces at three places in Swat since yesterday, a statement from the military said.